Aline didn’t wait for her holidays to get in the saddle: each day, this energetic production manager gets on her bike and hits the streets of La Rochelle. Two years ago, she decided to take off on La Vélodyssée® with her best friend. Two summers later, she’s covered the entire length of La Vélodyssée®, which hugs the Atlantic coast. She rode from La Rochelle to Hendaye first, and then from La Rochelle to Roscoff a year later. Here, she tells us about her adventures. Warning: you might be tempted to try it out too! “I discovered the joy of bike trips through my work at the International Adventure Film Festival and I quickly realised that this type of holiday suited me perfectly. When you’re pedalling, you feel free and so independent; you make progress under your own steam, but you can also stop when you feel like it. Our target was around 60km per day, but we weren’t there to rack up the miles, and we took the time to make the stops we wanted. Also, when you have this type of experience, your bike isn’t just a mode of transport to get you from A to B; the time you spend cycling is an inherent part of the journey. As you pedal, you see the countryside going by at a slower pace and admire details that you wouldn’t have noticed. Eventually, you realise that the landscape is always different. It’s constantly changing, from forest to ocean, and then the waves are replaced by the calm of oyster farms. It’s fantastic. 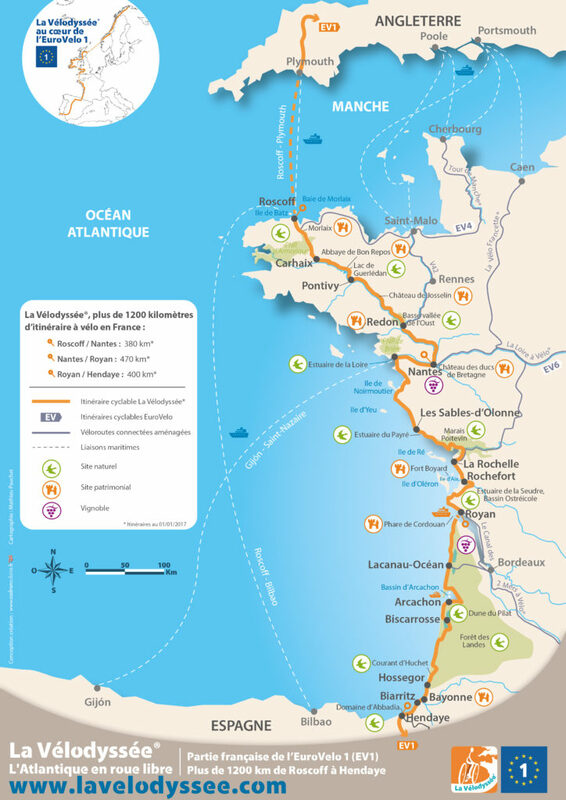 La Vélodyssée® is the longest cycle route in France, crossing Brittany and hugging the Atlantic right down to the Basque coast along an invigorating, wild route. This bike journey covers more than 1,200km between Roscoff and Hendaye, with the ocean to guide you! Natural and practical, the La Vélodyssée® route is entirely signposted, and 70% is car-free tracks. We particularly liked three locations on La Vélodyssée® in Charente-Maritime. The first was the Coubre forest, which was really pretty and smelled beautiful, before we then got to the Coubre lighthouse. We parked up our bikes to climb the lighthouse and admire the 360° view. My friend, who’s from Paris, loved that change of scenery. We felt the same when we arrived in Royan: we left La Palmyre forest and suddenly saw the coast with its rows of fishing huts… so charming! Lastly, exploring Charente-Maritime by bike also means visiting its islands. We chose Île d’Aix. The island, which can’t be accessed by car, lends itself particularly well to cycling and we got there by ferry – a journey in itself! Its manageablesize meant that we could really enjoy it. My tip would be to head to the far end of the island where you’ll find a fantastic hidden cove – you’ll think you’re in the south of France! On the practical side, because it’s really important if you want to complete the trip, we rentedrandonneuses, bikes that are made for this type of holiday. We used good waterproof saddlebags to transport our things and food, including nuts to stave off energy slumps. We also had our camping gear, and each night we looked for a pitch. We particularly liked the campsites that advertised themselves as Accueil Vélo© (bike friendly) because they often had space reserved for people on cycling holidays – that was a real plus and they were easily identified using our specialist guidebooks. So our little system worked well and it let us enjoy every day, pressure-free! That independence also made for a low-cost holiday. We had no transport costs and just a small food and accommodation budget. Loopi is a cycle route tool that’s as accurate as a paper guide and includes practical, leisure and tourist information. Download Loopi onto your phone and it’ll create a route and advise you where to stop. Being guided from A to B is a real luxury. You’ll find an itinerary you love thanks to its immersive 360° videos filmed from a bike: you’ll see a clearly marked track and the ocean on your screen and you’ll already be able to picture yourself there. And, of course, it lets you book activities online!